ندیم, محمدحسن, شیروانی, کوروش, نحوی, سید مهران. (1397). ساختار و خواص مکانیکی پوششNiCrBSi-WC(Co) اعمالی به روش پاشش شعله ای پرسرعت(HVOF). 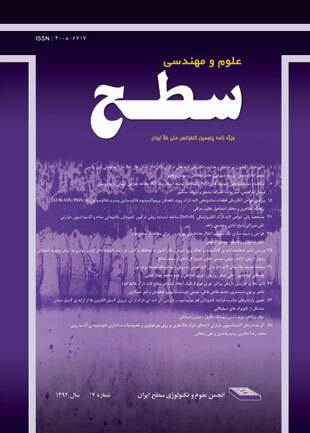 نشریه علوم و مهندسی سطح, 14(38), 53-60. محمدحسن ندیم; کوروش شیروانی; سید مهران نحوی. "ساختار و خواص مکانیکی پوششNiCrBSi-WC(Co) اعمالی به روش پاشش شعله ای پرسرعت(HVOF)". نشریه علوم و مهندسی سطح, 14, 38, 1397, 53-60. ندیم, محمدحسن, شیروانی, کوروش, نحوی, سید مهران. (1397). 'ساختار و خواص مکانیکی پوششNiCrBSi-WC(Co) اعمالی به روش پاشش شعله ای پرسرعت(HVOF)', نشریه علوم و مهندسی سطح, 14(38), pp. 53-60. ندیم, محمدحسن, شیروانی, کوروش, نحوی, سید مهران. ساختار و خواص مکانیکی پوششNiCrBSi-WC(Co) اعمالی به روش پاشش شعله ای پرسرعت(HVOF). نشریه علوم و مهندسی سطح, 1397; 14(38): 53-60. در این مقاله نتایج حاصل از بررسی اثر تغییر فاصله پاشش در روش پاشش شعله‌ای پرسرعت(HVOF) در اعمال پوشش‌های سرمت NiCrBSi-WC(Co) بر تغییرات ریزساختاری حاصل و نیز بر تغییرات خواص مکانیکی پوشش(شامل استحکام چسبندگی، سختی و مقاومت سایش) مورد بحث قرار گرفته است. برای ساخت نمونه‌های زیرلایه از ورق فولاد زنگ نزن SS304 استفاده شد. در محدود 300-200 میلمتر فاصله پاشش بررسی شده، با افزایش فاصله پاشش، ریزساختار لایه‌ای مناسب‌تر و همگن‌تر، با مقدار تخلخل و ذرات ذوب نشده کمتر، و توزیع بهتر ذرات کاربیدی در ساختار پوشش، حاصل شد. پوشش اعمال شده از فاصله پاشش 300 میلیمتر که مناسب‌ترین ساختار را داشت، بیشترین استحکام چسبندگی به زیرلایه، بیشترین سختی، البته با حفظ چقرمگی در پوشش، و کمترین نرخ سایش را نشان داد. 1. R. González, M. Cadenas, R. Fernández, J.L. Cortizo and E. Rodríguez, Wear behaviour of flame sprayed NiCrBSi coating remelted by flame or bylaser, Wear 262(3-4) (2007) 301-307. 2. J. M. Miguel, J. M. Guilemany, S. Vizcaino, Tribological study of NiCrBSi coating obtained by different process, Tribology International 36(3) (2003) 181-187. 3. T. Gómez-del Río, M.A. Garrido, J.E. Fernández, M. Cadenas, J. Rodríguez, Influence of the deposition techniques on the mechanical properties and microstructure of NiCrBSi coatings, Journal of Materials Processing Technology 204(1-3) (2008) 304-312. 4. M.J. Tobar, C. Álvarez, J.M. Amado, G. Rodríguez and A. Yáñez, Morphology and characterization of laser clad composite NiCrBSi-WC coatings on stainless steel, Surface and Coatings Technology 200(22-23) (2006) 6313-6317. 5. S. Buytoz, M. Ulutan, S. Islak, B. Kurt and O.N. Çelik, Microstructural and wear characteristics of high velocity oxygen fuel (HVOF) sprayed NiCrBSi–SiC composite coating on SAE 1030 steel, Arabian Journal for Science and Engineering 38 (2013) 1481-1491. 6. S. H. Yao, Tribological behavior of NiCrBSi–WC(Co) coatings, Journal of Materials Research Innovations 18 (2014) sup2: CMSE-2013. 7. C. Guo, J. Zhou, J. Chen, J. Zhao, Y. Yu, and H. Zhou, High temperature wear resistance of laser cladding NiCrBSi and NiCrBSi/WC-Ni composite coatings, Wear 270(7-8) (2011) 492-498. 8. X. Wang, M. Zhang, Z. Zou and Sh. Qu, Microstructure and properties of laser clad TiC+NiCrBSi+rare earth composite coatings, Surface and Coatings Technology 161(2-3) (2002) 195-199. 9. D.W. Wheeler and R.J.K. Wood, Erosion of hard surface coatings for use in offshore gate valves, Wear 258 (2005) 526-536. 10. J.Stokes, The theory and application of the SULZER METCO diamond jet HVOF thermal spray process, Sulzer METCO (2003). 11. J.G. La Barbera-Sosa, Y.Y. Santana, C. Villalobos-Gutiérrez, and M.H. Staia, Effect of spray distance on the corrosion-fatigue behavior of a medium-carbon steel coated with a Colmonoy 88 alloy deposited by HVOF thermal spray, Surface and Coatings Technology 205(4) (2010) 1137-1144. 12. L. Du, B. Xu, S. Dong, W. Zhang, Sliding wear behavior of the supersonic plasma sprayed WC–Co coating in oil containing sand, Surface and Coatings Technology 202 (2008) 3709-3714. 13. S. Buytoz, M. Ulutan, S. Islak, B. Kurt and O.N. Çelik, Microstructural and wear Characteristics of high-velocity oxygen fuel (HVOF) sprayed NiCrBSi-SiC composite coating on SAE 1030 cteel, Arab Journal of Science and Engineering 38 (2013)1481-1491. 14. X. Luo, J. Li and G.J. Li, Effect of NiCrBSi content on microstructural evolution, cracking susceptibility and wear behaviors of laser cladding WC/Ni–NiCrBSi composite coatings, Journal of Alloys and Compounds 626 (2015) 102-111.